Remove all ice from sidewalks. If you have a corner property, clear pedestrian ramps at the street corners and crosswalks to the street gutter. You are not required to clear snow ridges or piles left by the plows beyond the gutter. City crews will make an effort to return to do this work as quickly as possible, but with some 16,000 corners to clear across the City, it may take a while. However, your neighbors would appreciate it if you could clear the pile, or at least an opening sooner to help shorten the wait and provide a clear passage. If the sidewalk has not been cleared upon re-inspection, the property owner may be issued a citation with a fine, and crews will remove the snow and ice from the sidewalk. Property owners will be billed for this service, and unpaid bills will be added to property tax statements. You are responsible for clearing ice on your sidewalk as well as snow. Ice can be more dangerous and intimidating than snow. The sooner and more completely you shovel, the less likely it is that the snow will become compacted ice which is much more difficult to remove. 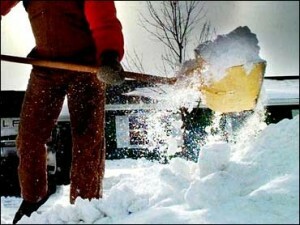 Arrange for someone to shovel anytime you are away. Shovel around your garbage carts and recycling bins. If you don’t, the City will do it for you and charge a fee. For information, see Solid Waste & Recycling. For ideas on where to look for help shoveling your sidewalk, please see the List of Helpful Resources.